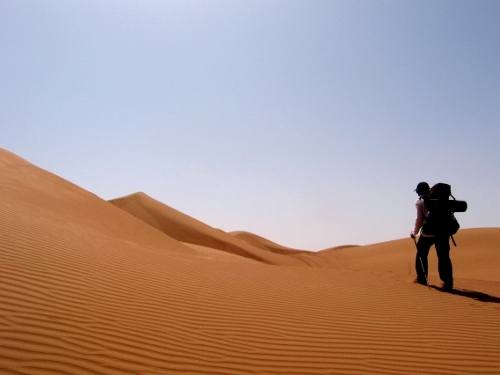 In February 2011, I walked across the Wahiba Sands by moonlight with my girlfriend Laura (now wife). 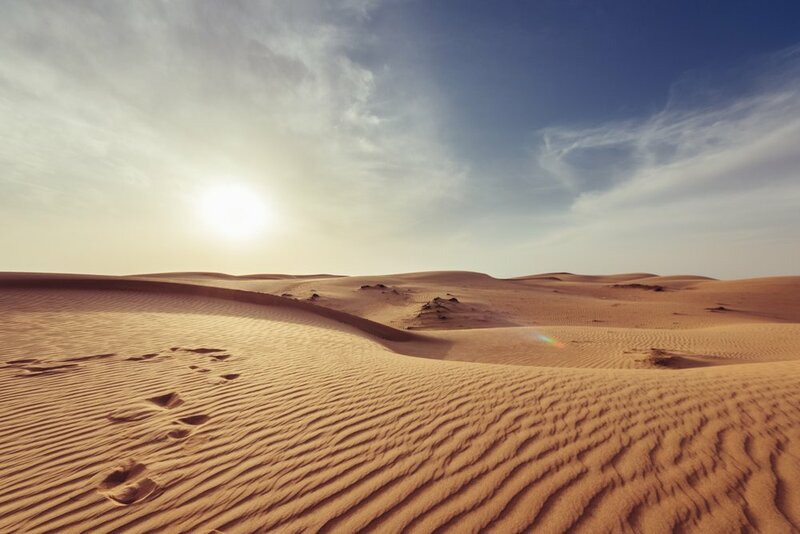 The Wahiba Sands (also called the Sharqiya Sands) is a small but prototypical desert &ndash; about 100 miles long and 50 miles wide and filled almost entirely with row after row of sand dunes. It's only a couple of hours drive from Muscat, Oman, and thus popular with tourists. The itinerary was simple: We drove as close as we could to the western edge of the dunes and parked our car. We loaded up our rucksacks with 10 litres or so of water and enough food for 2 or 3 days then walked east until the dunes stopped. We then made a bee line up to the road and hitched back to our car. We timed our trip to coincide with a full moon which meant it was easier to walk late in the evening and early in the morning when it was cooler. Although very brief, this remains one of my all time top expedition experiences. I was amazed that we found it at all. I'd zoomed in as close as possible on Google Earth to trace the fine lines of what looked like a dirt track ending at the western edge of the sand dunes. I jotted down the coordinates, punched them into the GPS we'd borrowed and was trying to navigate through the maze of Omani village back streets. Hard enough in day light, let alone the darkness that covered us as the clock approached midnight. Somehow we found the literal end of the road (it turned rather suddenly into sand), parked up and pitched for the night beneath the glorious orb of a full moon. It was no coincidence that the lunar cycle was reaching its zenith this weekend. We had planned this for many months, coordinating the brightest nights with our social calendar to find the perfect time to complete our desert crossing. We rose early the next morning and set a course east. A bearing we would more or less be following for the next 60km. The Wahiba Sands are a desert in every sense. Hot, dry and filled in their entirety by wave after wave of steep sided sand dunes. The dunes run north-south in parallel lines and our crossing would cut perpendicular across them all. Harder work than following one of the valleys along the line of least resistance but a lot more fun we thought. 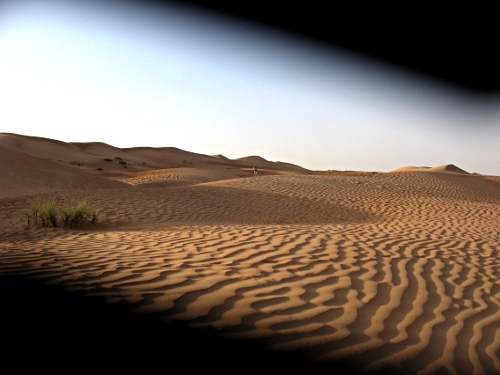 The Sands are well used by tourists, locals and Bedu alike. Most, if not all, valleys between the dunes have jeep tracks running through them, there are small settlements scattered throughout the area and a few tourist camps too. 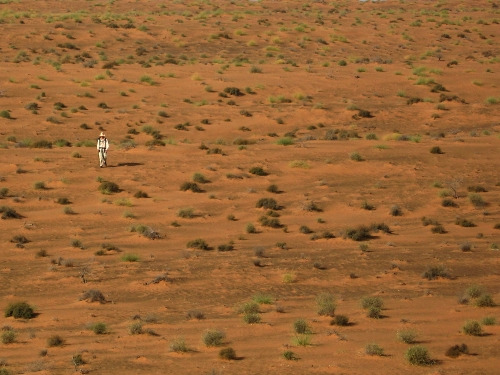 This was not remote desert exploration. It was a challenge we'd set ourselves as three people new to the desert. We chose to do the trip unsupported; in part because it made it purer and more challenging, but mostly because it was so much easier than arranging anything else. Our plan was simply to carry everything we needed to get us to the road on the far side of the Sands then hitch back to our car. We each carried 9 litres of water and three days food. I estimated our packs to weigh in at around 17kg (37lbs). Not heavy by military standards perhaps but enough to make us groan under the burden. Even before the sun had peaked across the horizon in front us, sweat crept onto my brow as we struck up the face of our first dune. We reckoned that there would be 26 such dunes to cross. Each one was up to a hundred metres or so in height and a kilometre or two wide. Sometimes it was hard to tell where one dune finished and the other started when we were lost in a sea of rolling sand hills but it was our easiest measure of progress; like counting lengths in a swimming pool. It wasn't until we'd slogged up half a dozen that John, who had joined Laura and I for the trip, and I'd remembered that due to the prevailing winds, the dunes were always steeper on the western side. A fact that may have been more useful before planning a west-east crossing. The logic behind timing our trip to coincide with the full moon was so that it would be bright enough to walk even when the sun wasn't up. This was a hot desert and even now, in winter, it would be tough going to walk through the heat of the day. Doing so would waste precious water on sweat too. So come midday, we sought the shelter of a tree and our tarpaulin to get some rest then pressed on in the late afternoon and into the night.